Mad Mushroom is one of those places that I have been to quite often the past few years, primarily because of its proximity to the Armstrong engineering building and the meal deals that they have going on during the week. I spent way too many hours last semester working on homework in Armstrong, and very frequently my friends and I would just walk over to Mad Mushroom to order something to eat. It provided a break from the burgers or sub sandwiches that are also closeby. I have to say that their pizza is kind of mediocre at best. Very frequently I would get extra cheese, simply because whenever I get any other toppings, they would be all clustered in the middle of the pizza and they don’t give you that much of the topping either. During the week, however, they always have some great deals going on with pizzas or different meal combos. For example, Mondays and Tuesdays is when you can pick up a 14″ large cheese pizza for just $5. Split that pizza between three or four people, and that’s quite the bargain. There are two items on their menu that I am a really big fan of though, and that’s their grinders and Cheesestix. Their Cheesestix are essentially pizza dough, brushed with garlic sauce, and topped off with a ton of mozzarella cheese on top. Served on the side with dipping sauces such as pizza sauce, nacho cheese, or ranch, to name a few, Cheesestix really are quite addicting. 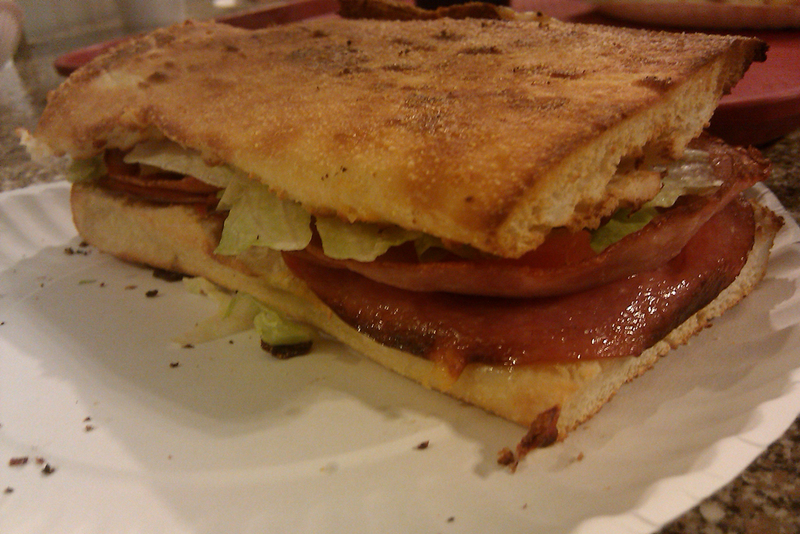 Grinders are sandwiches that are made out of pizza dough serving as the bread. Mad Mushroom is the only place that I’ve seen so far that makes these, and they are quite delicious. 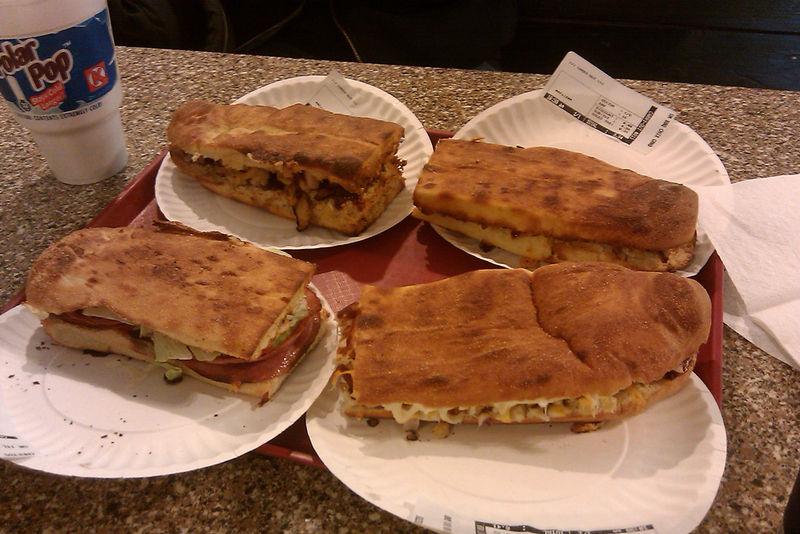 They have 15 different types to choose from, ranging from BBQ Chicken to Italian Beef (roast beef, pizza sauce, onions, green peppers, mozzarella) to Chicken Club (chicken strips, bacon, mozzarella, lettuce, tomatoes, mayo). Mad Mushroom has a great lunch special that for $6 you can get a grinder, a 20 oz. drink, and a bag of chips. In the past, each semester Mad Mushroom has held a “Free Cheesestix Day,” where you can go in and grab a small Cheesestix for nothing at all. Be prepared to wait for it though; last time I waited a solid 45 minutes before I got mine! 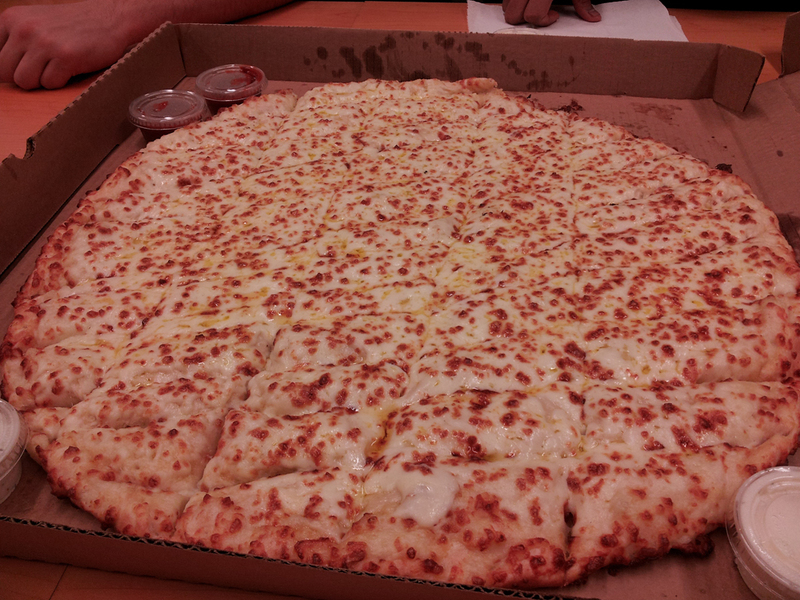 I guess it’s also a notable mention that last semester while doing homework, my friends and I decided to take on Mad Mushroom’s “Ginormous Feast,” consisting of one 20″ extra-large Cheesestixs and one 20″ extra-large cheese pizza. To put that into perspective, that is almost 18 square feet worth of dough and cheese. Even with six people, we could only finish about half of it. 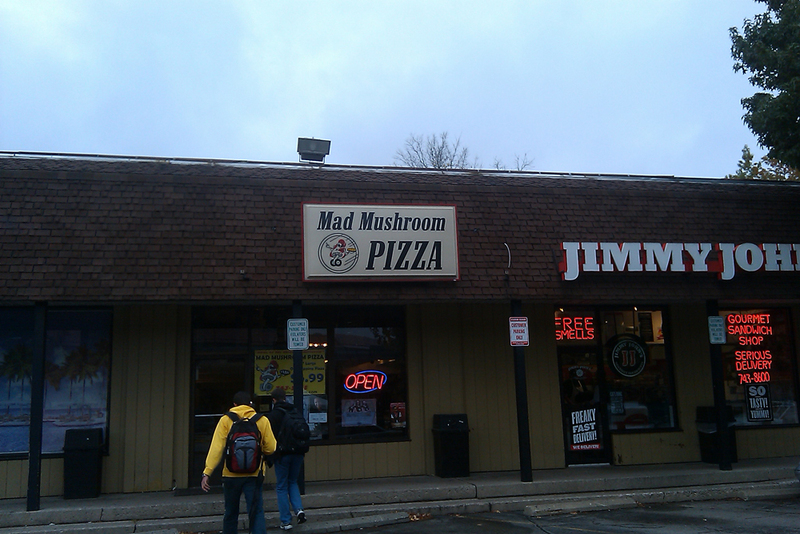 Give Mad Mushroom a try at some point; if not their pizza, one of their other menu offerings. For me, that value that you get out of the pizzas from the weekly deals definitely make it worthwhile. 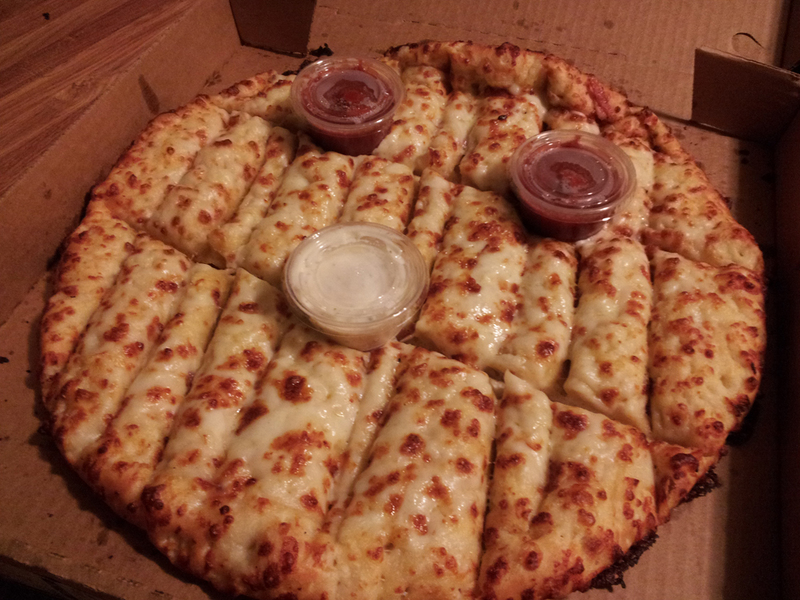 The fact that their grinders and Cheesestix are so delicious never hurts either. While their pizza falls a little short, Mad Mushroom’s signature Cheesestix and grinders definitely help to redeem them. Their wide menu offerings also help out, too. I wouldn’t describe there as being a true dining area, as it’s just made up of wooden booths lined up along the wall as well as some additional seating on the second floor overhang. Definitely looks like it hasn’t been redone since it was first opened. There are times when you walk up to the counter, and no one is there to help you for a few minutes. Other times, there will be someone that comes over to you immediately and takes your order, so it’s kind of hit-or-miss. With their meal combos, both pizza and lunch specials, I am inclined to say that you get a good amount of food for the price that you pay.